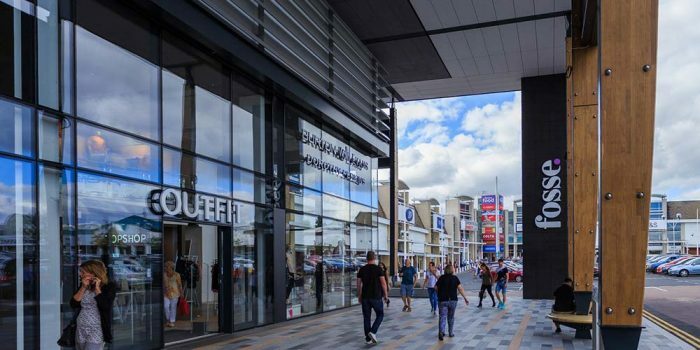 The redevelopment of Fosse Shopping Park in Enderby, Leicestershire, has been recommended for approval by Blaby District Council. The plans from Wexford Retail and Fosse Park West propose the demolition of the current Fosse Park Food Court to make way for a new food court which will link the Fosse Park Retail Area to the new Castle Acres development. The new food court will be made up of a two storey building with food and beverage units, retail kiosks and eating areas on the ground floor, and staff areas on a smaller mezzanine level. A modern design with large glazed openings is planned to keep with the approved Castle Acres development. The new building is to have a gross external area of 4930Sqm and be 114m in length by 49m in width. A council document states: “The application proposes the demolition of the existing food court building and of its replacement with a new food court building designed with the purpose of providing improved facilities and a purpose built attractive link between the existing Fosse Park Site and the upcoming Castle Acres Development. “As set out above it is considered that the proposed development would be in-keeping with the established character and appearance of the area, would not have significant highways impacts and would not result in undue impacts on the biodiversity, historic assets or residential amenities.